﻿Easy Care Perennial Gardening? 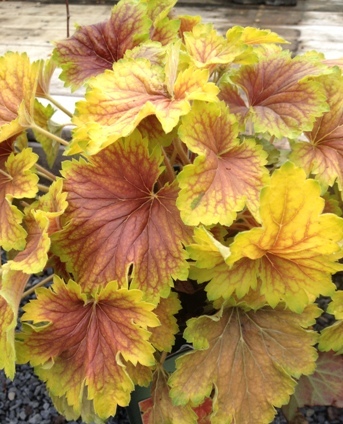 | Faddegon's Nursery, Inc. If you are like many people I talk with, you probably feel low-maintenance perennial gardening is a big-time myth! We throw up our arms in exasperation as our gardens mock us with their disheveled, lackluster appearances while screaming for attention. In many cases poor plant choices or maintenance practices are the culprits. Or, perhaps, it is the misguided notion that low-maintenance means no maintenance. In any case, our gardens act like out-of-control, unruly children. Well, it is time to reclaim the driver’s seat, take the bull by the horns, and bring order out of chaos. No more allowing our gardens to bully us around. I hope the following practical tips on how to choose well-behaved ‘model children’ for your gardens will start tipping the scale in your favor. Don’t Zone Out. Pick plants that are appropriate for your hardiness zone. Hardiness zones now range from 1 to 13. The higher the number, the warmer the winters need to be for the plant to survive. Most gardens in the Capital Region are either Zone 4 or 5. 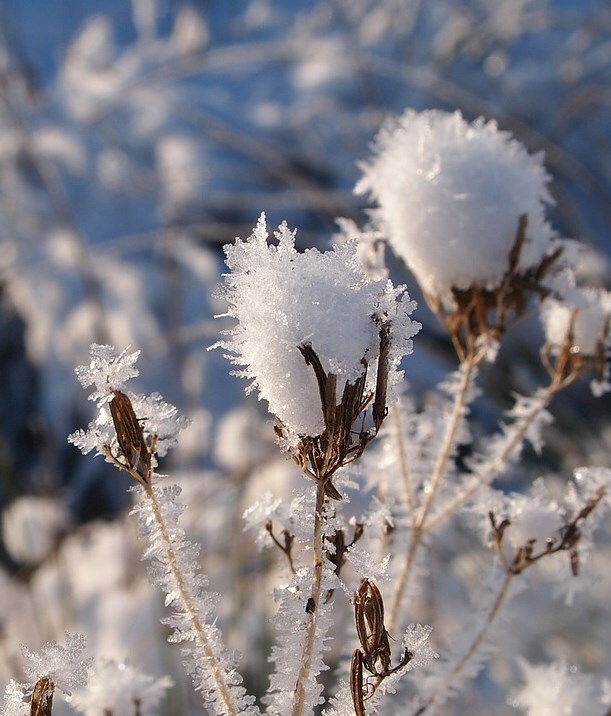 A plant rated to Zone 4 should winter through temperatures as low as 20 to 30 degrees below zero: Zone 5 should handle 10 to 20 degrees below zero. Please note I said should make it through the winter…..if you don’t want to risk winterkill, buy plastic or silk flowers! Let’s face it, all living things eventually die – it may be due to Old Man Winter; a weakened state caused by disease; or simply a dog using the plant as a fire hydrant.Personally, I refuse to put down any winter mulches as a protective ‘blankey’ on my gardens. If a perennial can’t make it through the winter without assistance, I’ll find one that can. That is why I have mostly Zone 4 plants in my northern Saratoga county gardens. Having lived in Lake Placid for years (Zone 3), I feel like I’m now gardening in the tropics in comparison. Tough love…it works! And for goodness sake, a plant that is labeled as a ‘tender perennial’ has no business shacking-up in my low-maintenance perennial beds. Watch Out for Thugs in Disguise. Thugs. They usually go “under cover” as gifts from well-intentioned friends. Thugs can be nuisances in two ways –either they can’t keep their roots to themselves and are on a mission to take-over the ENTIRE garden, OR they sow their fertile little seeds with great zeal all over the place. Both infractions result in aggressive reining-in maneuvers on our part, or, if we are talking about any plants in the mint family – calling in a SWAT team!How can we prevent this maintenance nightmare? Pretty simple. 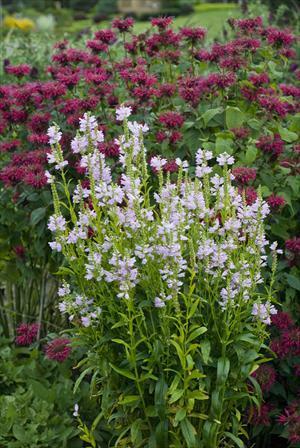 First, the next time a friend comes bearing gifts (perennials that is), before accepting the plants, take three steps back and ask WHY they have such a surplus of, let’s say Obedient Plant (Physostegia – pictured with Bee Balm). Many times their response will include red-flag words such as invasive, groundcover (HINT! ), fast spreader, jubilant self-sower, and perhaps even words that are not appropriate for me to include here. If this is the case, before planting a potential renegade in your garden, take precautionary measures. Place it in a plastic pot with the bottom cut off (be sure to leave 5”-6” of siding on the pot) and sink it into the garden OR surround the plant with landscaping edging to make an interesting prison for the plant to roam within (again, be sure the edging reaches down into the soil at least 5” or more). Remember, you’re the boss, you’re in charge of defining its play area…NOT the other way around. The A Team. Move aside all of your delicate, frail, attention-demanding prima donnas. Low-maintenance flower gardens are the workout arenas for no-nonsense, long-blooming, disease-resistant perennials. I want workhorses that will make me look good without excessive preening or nursing (I have family members that have a corner on that market). My mantra is give me four plus weeks of flowers or attention-grabbing foliage, or move to the back of the line. And my perennial A Team can’t require a lot of deadheading, staking, frequent divisions, or chasing after spreading roots and flying seeds. Aren’t I the demanding one? Yes – and you should be too! 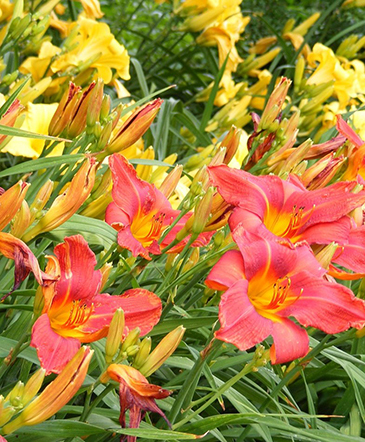 Top team players on my roster include repeat blooming Daylilies, Threadleaf Coreopsis (i.e. ‘Moonbeam’), Lady’s Mantle, Helen’s Flower (Helenium), Sedum, some Black-Eyed Susans, Geranium ‘Rozanne’, Foam Flower (Tiarella), Hosta, Coral Bell (Heuchera ‘Delta Dawn’ pictured), Bishops Hat (Epimedium), Russian Sage, and Toad Lily (Tricyrtus). So go ahead and build yown ‘super bowl flower team’ by adding some of these stalwarts to your gardens and stand back for the applause.our own ‘super bowl flower team’ by adding some of these stalwarts to your gardens and stand back for the applause. Befuddling Biennials. Okay, let’s cut to the chase on this one. Biennials have a two-year life cycle. The first year – leaves, second year – flowers, third year – dead. Not a ‘happy ever after Cinderella story’ UNLESS you’re careful to allow some flowers to go to seed and sow themselves in the garden to insure more flowers the following year. Most biennials produce ‘free-spirited’ seedlings that germinate wherever the breeze may carry them, which may require you to dig and replant the little gypsies to spots in the garden where you want them. All of this translates into planning ahead, plus time and effort on our part (like parenting!). 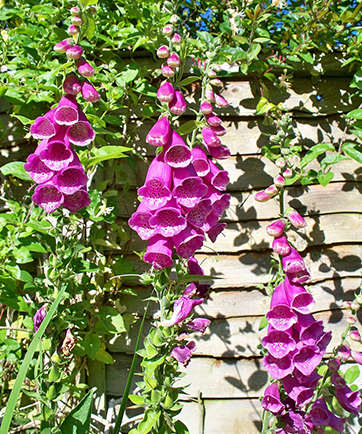 Foxgloves are a popular biennal (pictured is ‘Pam’s Choice’). So, to ‘biennial’ or ‘not-to-biennial’. Your call. They are not the ‘no brainers’ like those on my A Team but, many of us still insist they deserve a spot in our low-maintenance gardens.